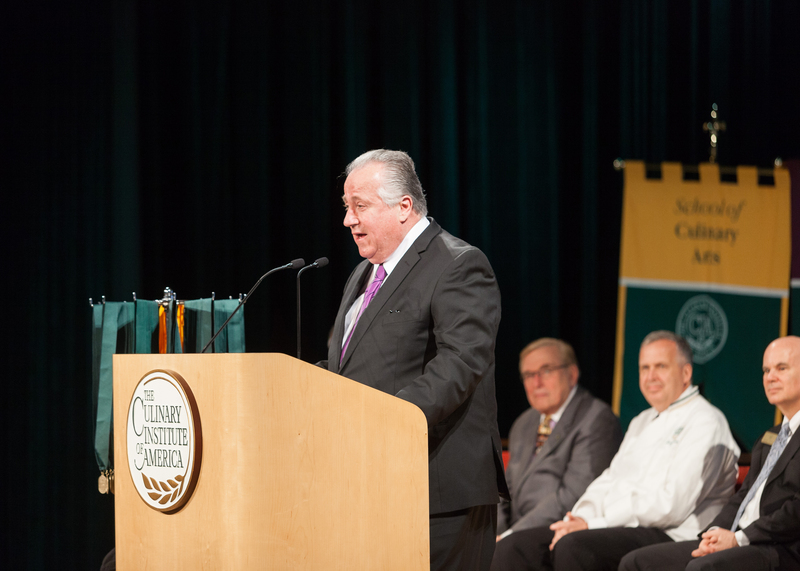 Hyde Park, NY – Graduates of The Culinary Institute of America learned the importance of paying it forward when Angelo Vivolo, owner of Vivolo Restaurant Group in New York City, delivered the commencement address at the college’s New York campus on May 5. In addition to a 40-year career running multiple restaurants, Chef Vivolo has devoted much of his life to giving back to his community. His support of charitable organizations includes Share Our Strength, UNICEF, and the James Beard Foundation, among others. In his role as president of the Francesco and Mary Giambelli Foundation, he oversees an endowed scholarship at the CIA in the Giambellis’ memory. A long-time friend of baseball Hall of Famer Joe DiMaggio, Vivolo represents the late Yankee star’s estate in supporting a scholarship in DiMaggio’s name at the Columbus Citizens Foundation. Although Vivolo was never able to fulfill his own dream of becoming a major league ballplayer, he did play in the College World Series with Long Island University in 1968. Among Chef Vivolo’s many career highlights has been the opportunity to serve both Pope Benedict in 2009 and Pope Francis in 2015 when they visited the United States. The entire CIA graduation ceremony, including Chef Vivolo’s address to 110 recipients of CIA associate degrees in culinary arts and baking and pastry arts, can be seen online.